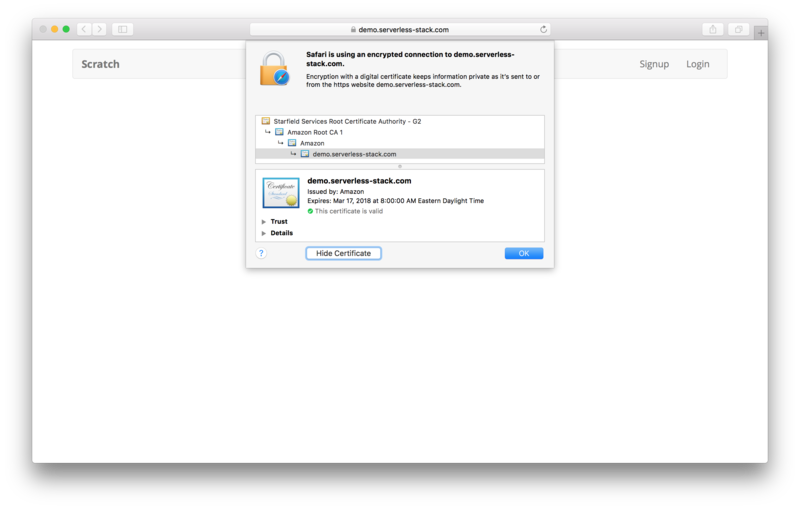 Now that our app is being served through our domain, let’s add a layer of security to it by switching to HTTPS. 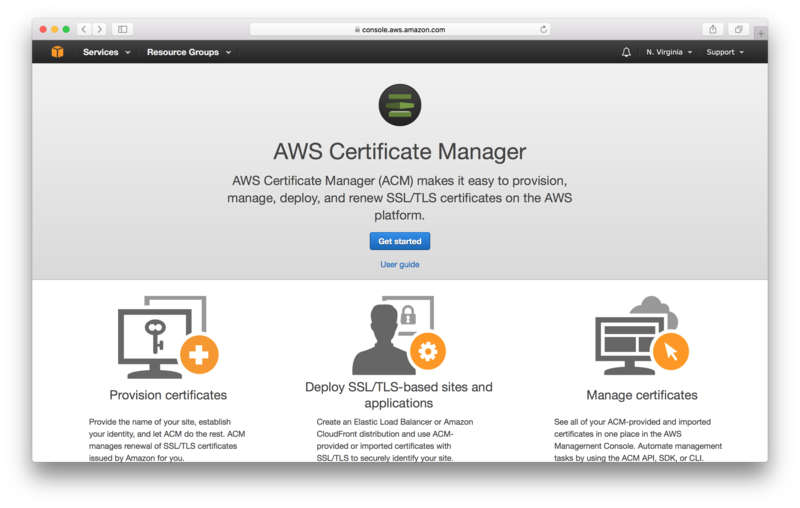 AWS makes this fairly easy to do, thanks to Certificate Manager. 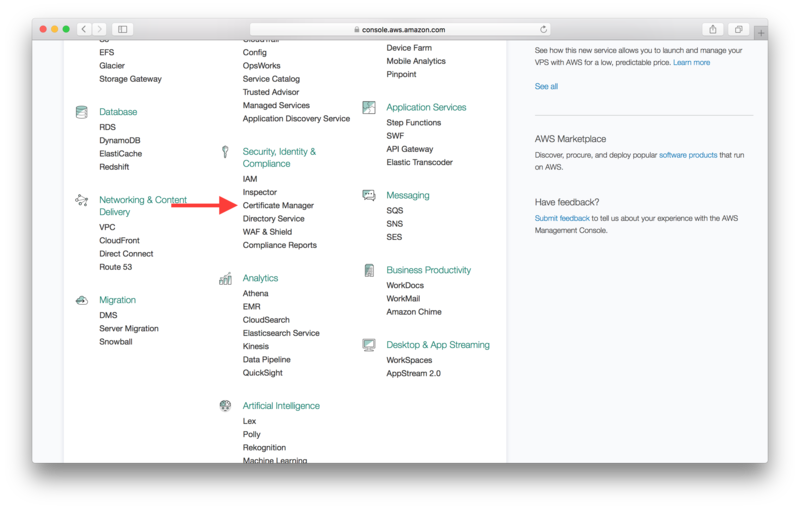 Select Certificate Manager from the list of services in your AWS Console. Ensure that you are in the US East (N. Virginia) region. 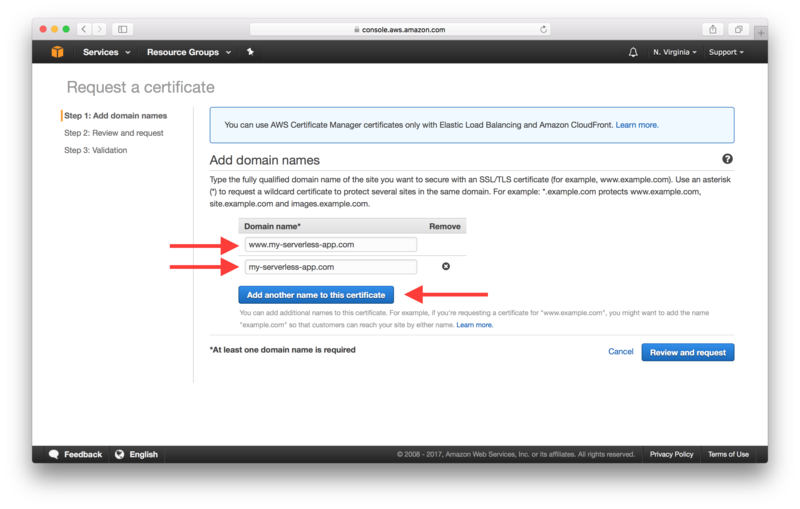 This is because a certificate needs to be from this region for it to work with CloudFront. If this is your first certificate, you’ll need to hit Get started. If not then hit Request a certificate from the top. And type in the name of our domain. Hit Add another name to this certificate and add our www version of our domain as well. Hit Review and request once you are done. 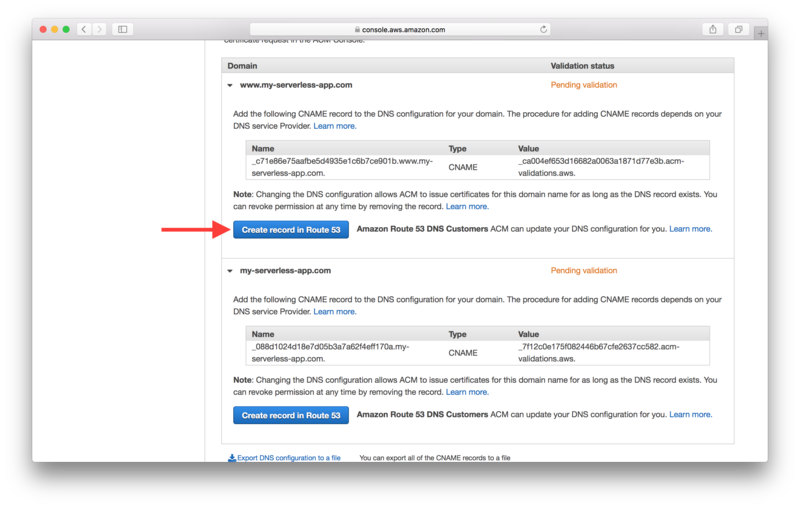 Now to confirm that we control the domain, select the DNS validation method and hit Review. On the validation screen expand the two domains we are trying to validate. 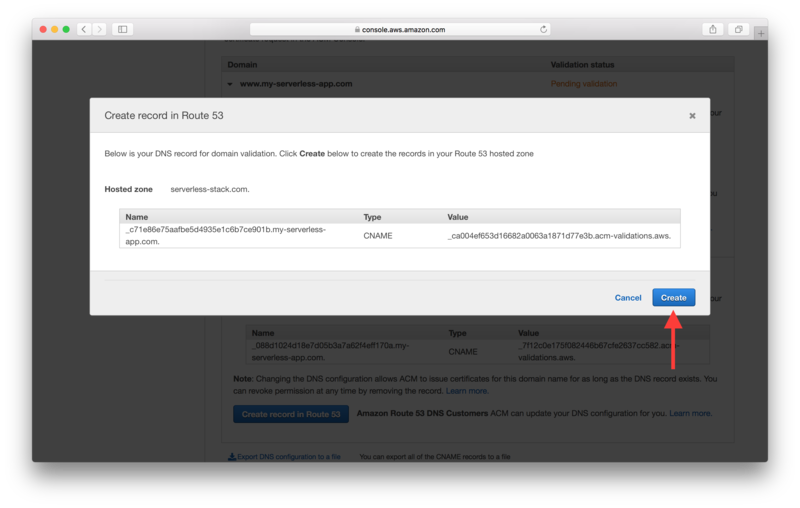 Since we control the domain through Route 53, we can directly create the DNS record through here by hitting Create record in Route 53. And confirm that you want the record to be created by hitting Create. Also, make sure to do this for the other domain. 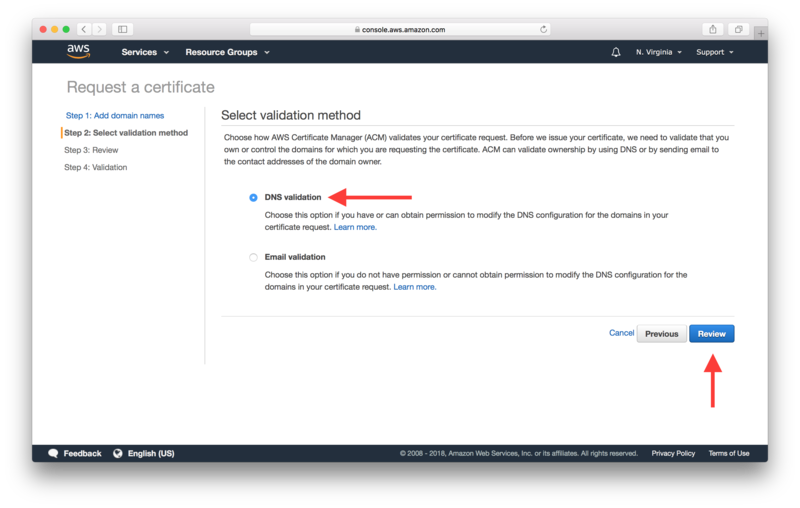 The process of creating a DNS record and validating it can take around 30 minutes. 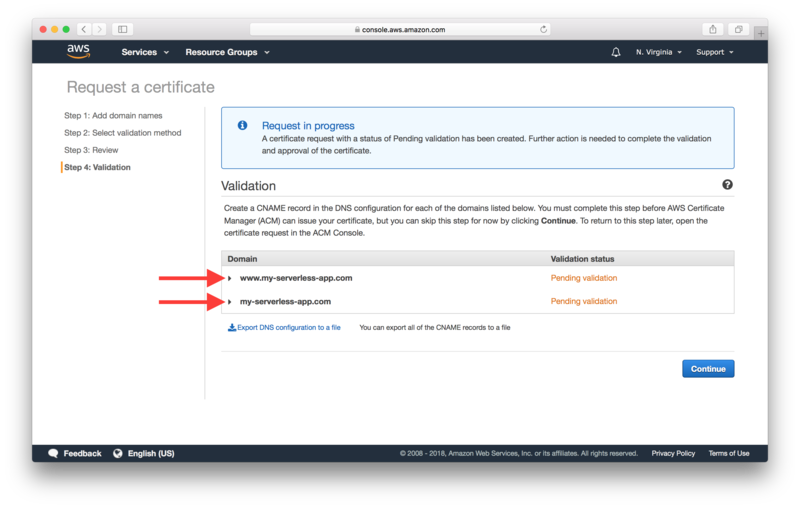 Next, we’ll associate this certificate with our CloudFront Distributions. 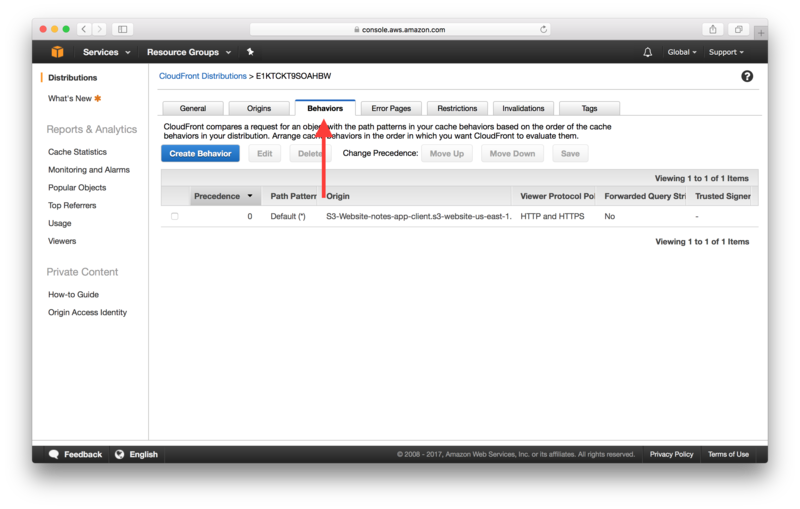 Open up our first CloudFront Distribution from our list of distributions and hit the Edit button. 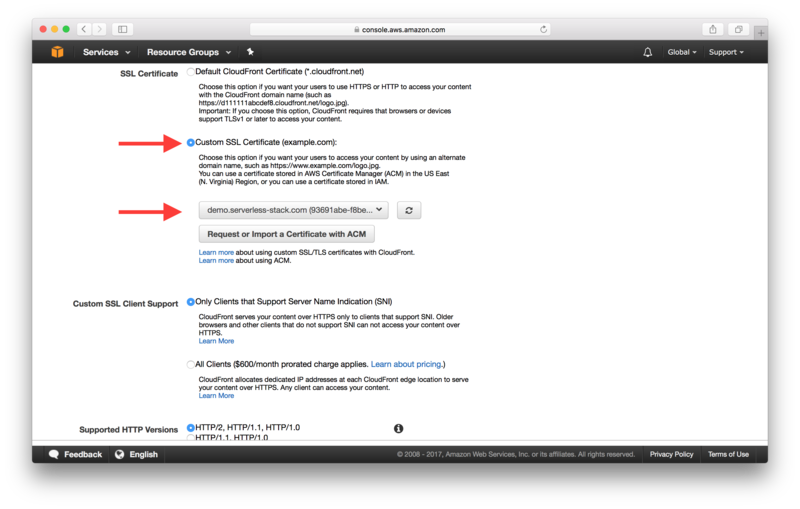 Now switch the SSL Certificate to Custom SSL Certificate and select the certificate we just created from the drop down. And scroll down to the bottom and hit Yes, Edit. Next, head over to the Behaviors tab from the top. And select the only one we have and hit Edit. 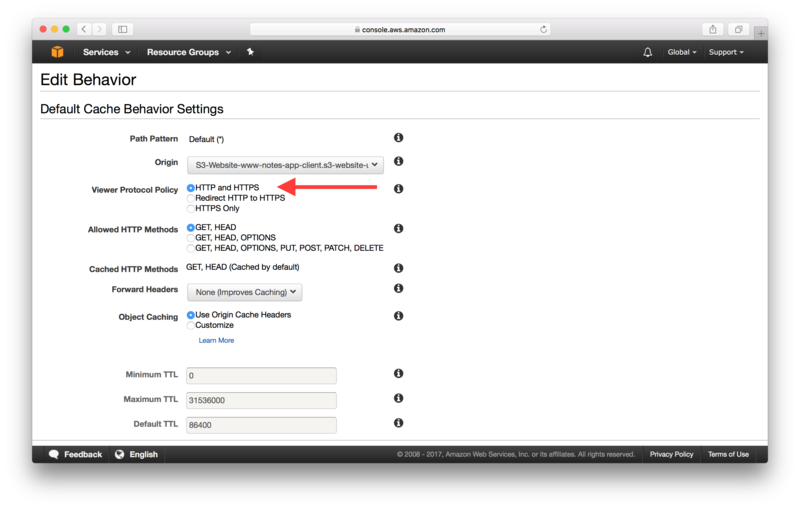 Then switch the Viewer Protocol Policy to Redirect HTTP to HTTPS. And scroll down to the bottom and hit Yes, Edit. 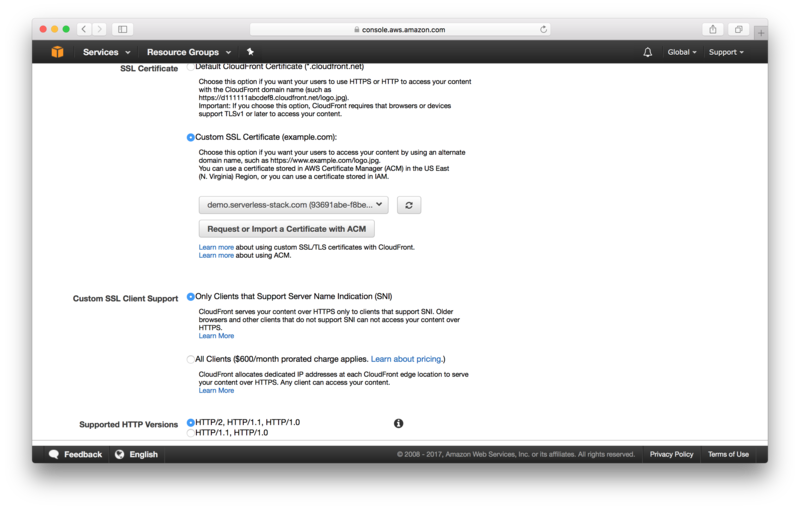 Now let’s do the same for our other CloudFront Distribution. But leave the Viewer Protocol Policy as HTTP and HTTPS. This is because we want our users to go straight to the HTTPS version of our non-www domain. As opposed to redirecting to the HTTPS version of our www domain before redirecting again. 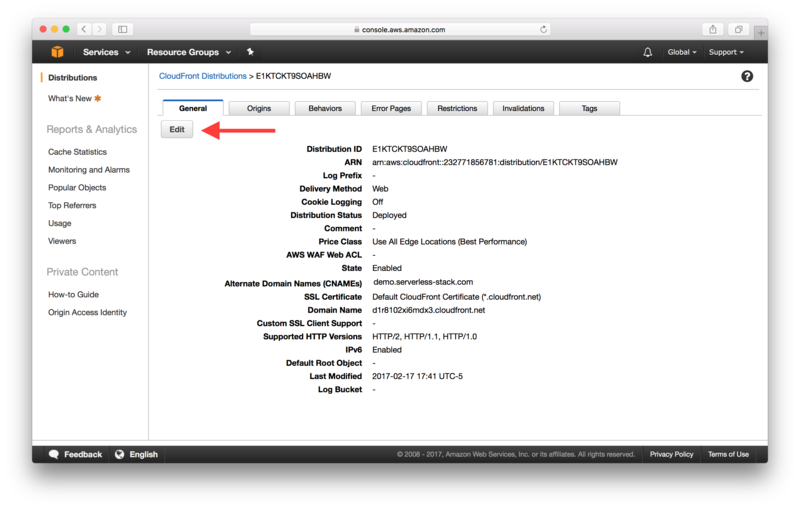 The S3 Redirect Bucket that we created in the last chapter is redirecting to the HTTP version of our non-www domain. We should switch this to the HTTPS version to prevent the extra redirect. 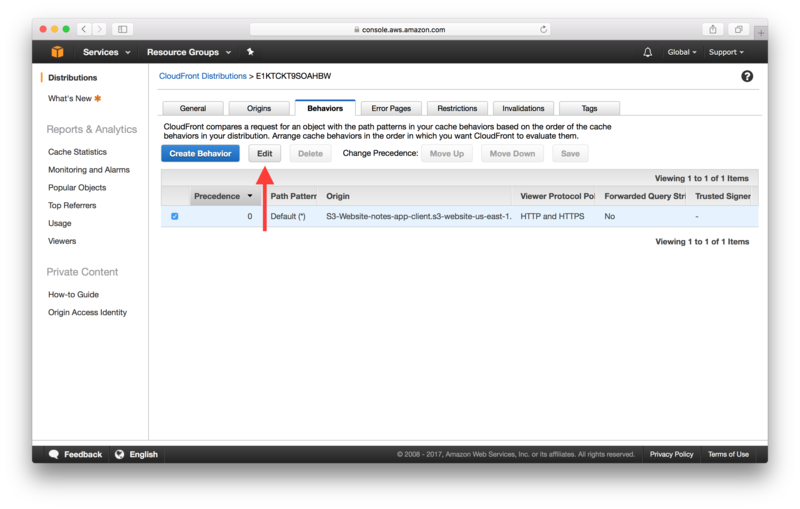 Open up the S3 Redirect Bucket we created in the last chapter. 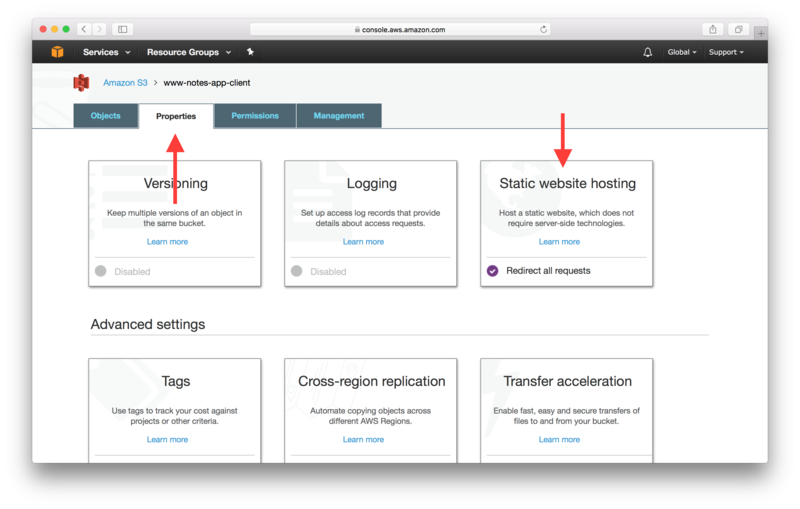 Head over to the Properties tab and select Static website hosting. Change the Protocol to https and hit Save. And that’s it. 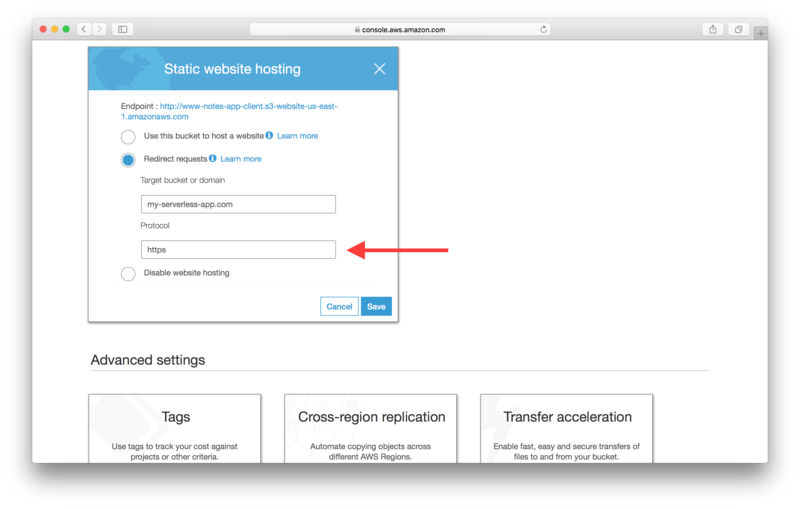 Our app should be served out on our domain through HTTPS. Next up, let’s look at the process of deploying updates to our app.